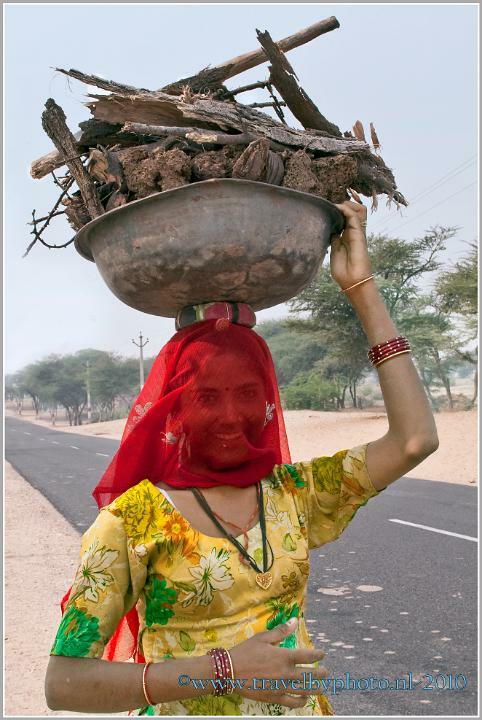 This is our second trip to Rajasthan. 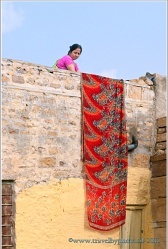 We have been to Rajasthan before in 2006 (travelogue). It was our first trip to a distant destinationthe and was impressive. 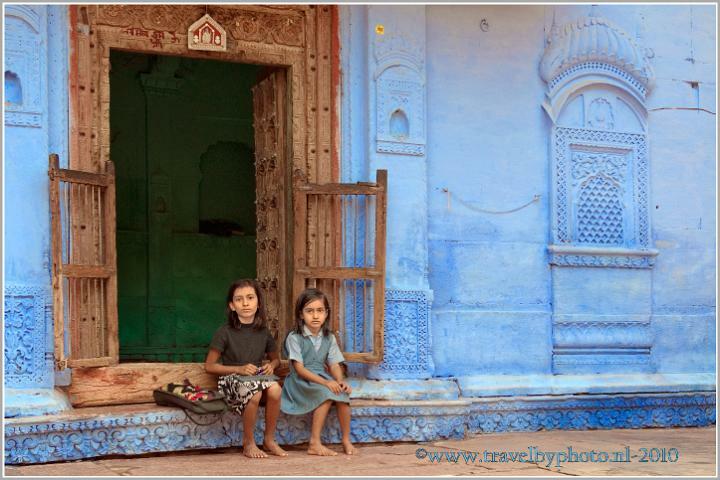 Our desire to return once more to this colourful state in India was high on our wish list. That wish is fulfilled in November 2010. We booked a wonderful journey composed exactly to our personal wishes by Namasté, a Dutch travel agency that had already provided our trip to Sri Lanka. 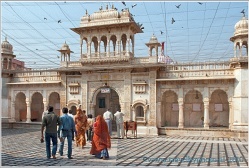 We have skipped a number of the famous tourist attractions / cities in this Rajasthan tour because we were there before. It gives us more time to explore more unknown rural places; especially after the first week . 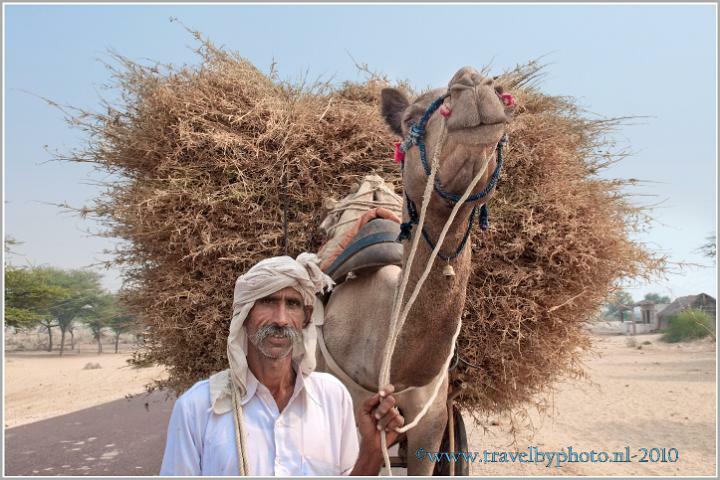 During the tour we’ll sleep in Havelis, forts and tents and we will visit two camels markets. The famous Puskar Fair and the less known but equally special Jhalawar fair. When reading the travel report: click at a picture and it will be increased. After clicking the photos can also be viewed as a slideshow. If you see a link, like: Namasté click on the link and it will be opened. When referring to the map of Rajasthan, the map can be accessed by clicking on the link: Map of Rajasthan. 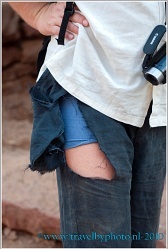 The film clips that are included in the travelogue are HD recordings. The clips can be opened and viewed in a separate window. The week before departure we experienced a lot of extra hassle with our visas. We knew that it was no longer possible to collect the needed visas at the embassy in The Haque, but we didn’t know that the gouverment of India had introduced a whole set of new rules and conditions - like a employer's certificate in English - to be eligible for a visa. Thanks to an employee of the visa office everything came in order on time so we are able to fly to Delhi as planned. Early in the morning we are brought to the airport by our daughter Marjon and her friend Bram . 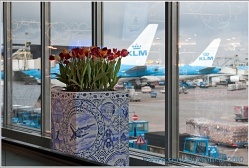 We have a direct flight from Amsterdam to Delhi. Very comfortable! We really look forward to the trip we are going to make! The aircraft leaves on time. Thanks to the tailwind the flight takes only 6 hours. 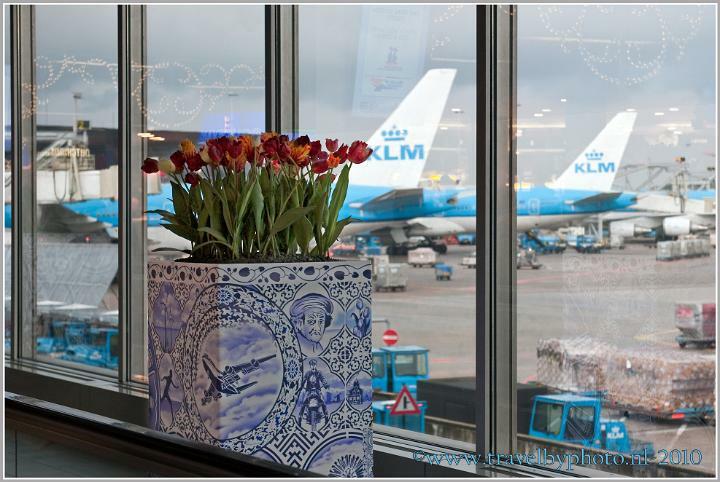 Very special to imagine that it only takes so little time to reach India from Holland. Deep in the night we arrive at Delhi airport. Delhi airport really has changed. The airport is spacious and modern compared to our first arrival in 2006! 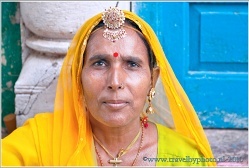 A representative of our local Indian travel agency is waiting for us at the arrivals. We walk with him to the car. In the car we are introduced to our driver for this tour. The four of us drive to the hotel where we receive our travel documents and vouchers in the lobby. 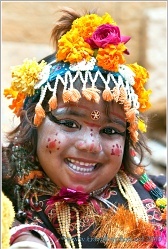 We have previously indicated that we do not want to spent much time in Delhi. Therefore, the agent has booked a simple hotel (the Shanti Palace) for us near the airport . We have a comfortable room . It will be easy to travel the next day from here to Rajatshan. We settle with the driver that he will pick us up at the hotel the next day at 8:30 a.m. Our driver Kuldeep seems to be a friendly man. Day 2: Sunday, November 7, 2010. We leave on time. 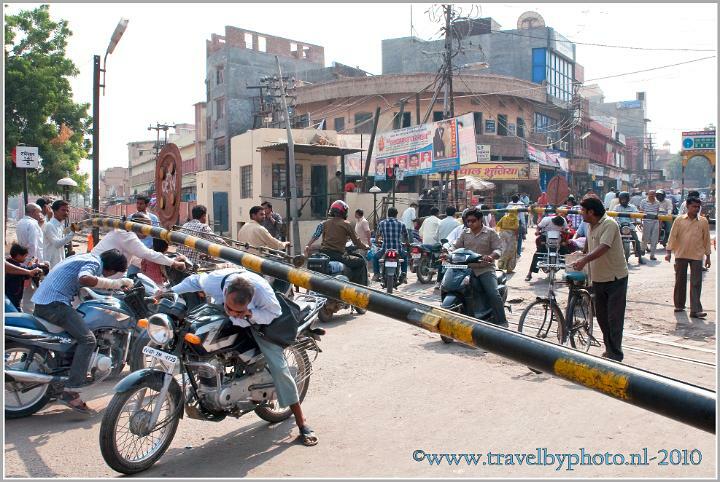 The city of Delhi has been thoroughly addressed because of the Commonwealth Games that has been here this summer. The caws and bicycle rickshaws seems to be banned out of the city but as soon as we leave the city behind us it is the for us the familiar Incredible India again. We drive to Mandawa. When we arrive in Mandawa we have a guided city walk and admire the beautiful Havelis , the coloured walls and the frescoes on the walls. We stay in a unique hotel. 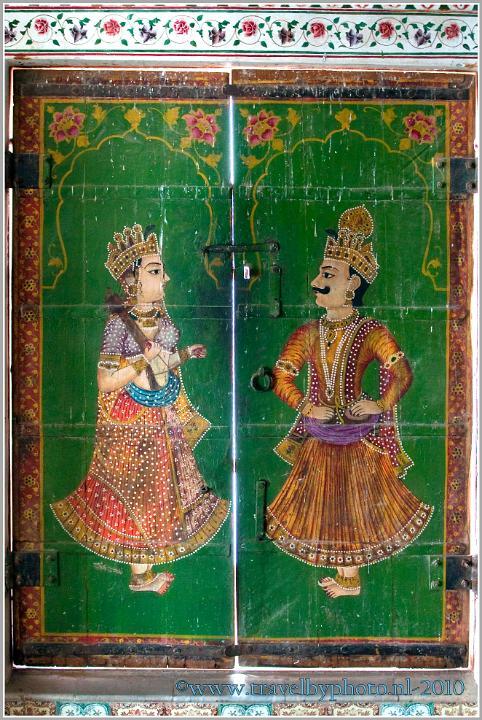 Hotel Mandawa Haveli is situated in an old Haveli built in 1890 by a local jeweller as his family residence. The building is a jewel on itself. Many beautiful frescoes that are still well preserved. Our room is a picture; very authentic. Sitting in our room we can imagine how life must have been here over 100 years ago. The building forms a square, with a central open courtyard. We have our room on the first floor overlooking the courtyard. In front of our room is a kind of balcony with a balustrade. The balcony is very small and the balustrade is only 40 cm high. Ingrid is afraid that she will stumble and fall down. It doesn´t happen, she is cautious and everything goes well. In the evening we enjoy a candle lit dinner buffet with entertainment in the Jeeman restaurant of our hotel. The restaurant is situated outside on the rooftop. The food was very good. After a good night sleep we have breakfast in the hotel. The Hotel is just outside the main gate near the city centre of Mandawa. Before we drive to our next destination Bikaner we have some time to spent for an extra walk around in Mandawa. It is a very nice town. Time seems to have stopped here. 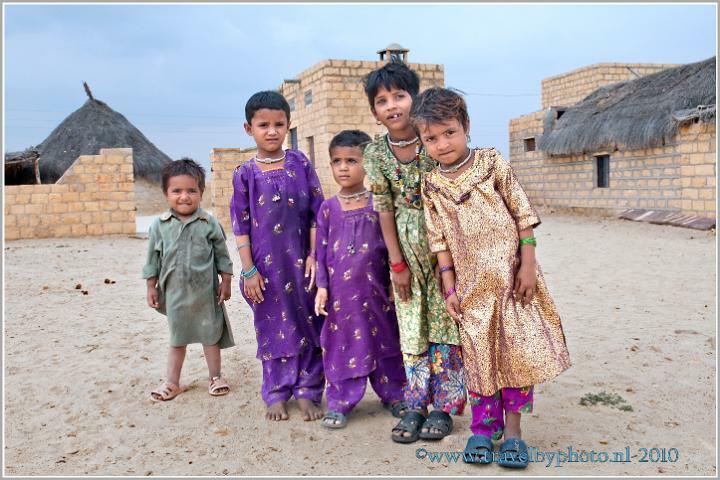 There are many Havelis in this village. Too bad most are neglected and uninhabited. They almost collapse! It is still early in the morning and the city slowly awakes. The shopkeepers sweep their sidewalks clean and the marketers transport their merchandise on wooden carts with big wheels. Always fun to sit on a sidewalk watching all the people come by! During the morning we drive to Bikaner (Map of Rajasthan). It is a nice ride. We are in no hurry and make some extra stops. We see a herd of cows emerging from a cloud of dust and we meet a man with a cart full of hay posing proudly for us in front of his cart with his camel. We also see 3 beautifully dressed women who carry with much grace large quantities of firewood in a bowl on their heads. 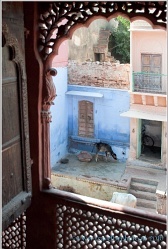 When we arrive in Bikaner the first stop is our hotel; the Bhanwar Niwas Hotel. The hotel is situated in a historic building - located at the centre of the city and we have a beautiful room. We have lunch in a restaurant opposite the Junagarh Fort. The restaurant has a concierge with a very long (dyed) moustache. He proudly unrolls his moustache for us with a big smile on his face. Wow, very impressive. After lunch we visit the Junagarh Fort itself (founded in 1593) and we wander through the city enjoying the busy streets, markets and people. Absolute chaos! 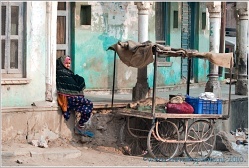 Bikaner is a town on the edge of the Thar desert. After a busy day we have diner in the hotel and Jan-Arend enjoys a nice massage before going to bed. Today we visit Deshnok. Deshnok is a small town situated 30 km from Bikaner and home to the famous Karni Mata Temple. 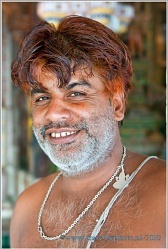 Karni Mata is the patron saint of the temple and the region. She lived in the 14th century and delivered many miracles during her lifetime. 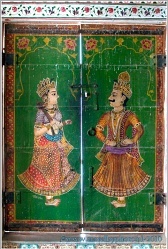 One of the miracles she has performed was that she aroused her son Lakhan back to life after he was drowned. The temple is quite famous for a large number of brown rats running around fearlessly in the temple complex. Karni Mata swore that her family would never really die, they would reincarnate as “kabas” rats. And so it is believed that the souls of dead Charans (the devotees of Mata) reside in these rats. 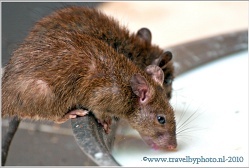 It is considered very lucky to spot a white rat in the temple. 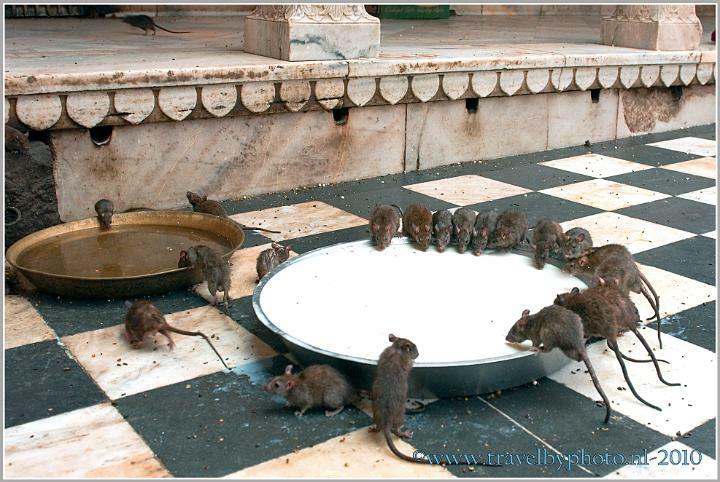 During the time of aarti, these rats are offered sweets, grains, etc. by the devotees. We were at the temple before in 2006, and it's really a unique experience. Upon arrival we were shocked by what we find because everything seemed to be changed dramatically. We spot many tourist buses. Inside the temple our fear is proved to be ungrounded. Most visitors are domestic tourists and pilgrims. We have all the time to experience the environment. 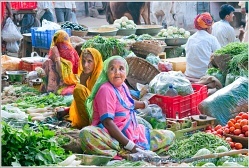 On the square before the temple is a small market where sacrifices are sold. We buy some trinkets for our very simple altar at home. Inside the temple nothing has changed. The rats, many hundreds in number, are there and they are still overfed and don’t look healthy. It is funny to see a dozen rats drinking milk in a circle from a bowl. Suddenly one of the rats falls into the bowl. Moment later he climbs out with a lot of splashing; half drowned. 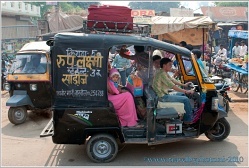 At half past 9 a.m. we are picked up at the hotel for a city tour in Bikaner with a Tonga. A Tonga is a horse with a wagon. It's a fun ride through the narrow streets of a town that slowly awakens. 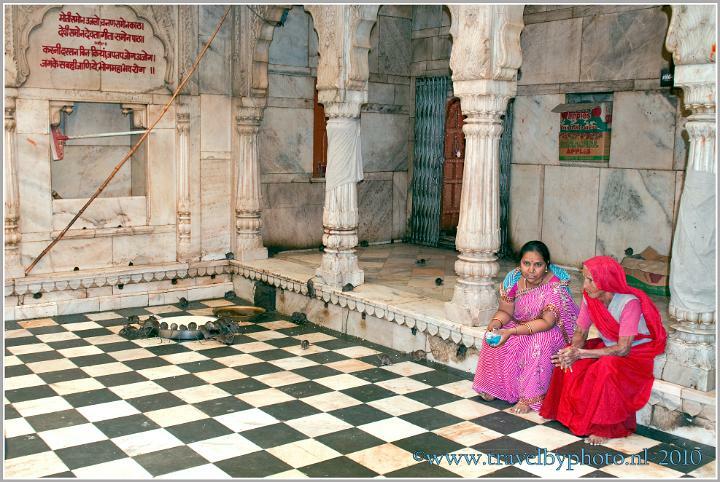 We stop at the Bhandasar Jain temple built in the Middle Ages where a priest gives us a tour. 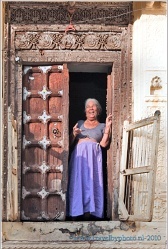 In other Jain temples decorations are carved out of wood or stone. 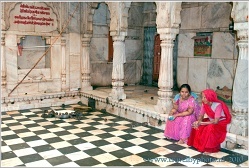 This temple is the only painted Jain temple there is. Very nice! After our tour we are dropped at the Junagarh fort where Kuldeep waits for us. On to Phalodi! 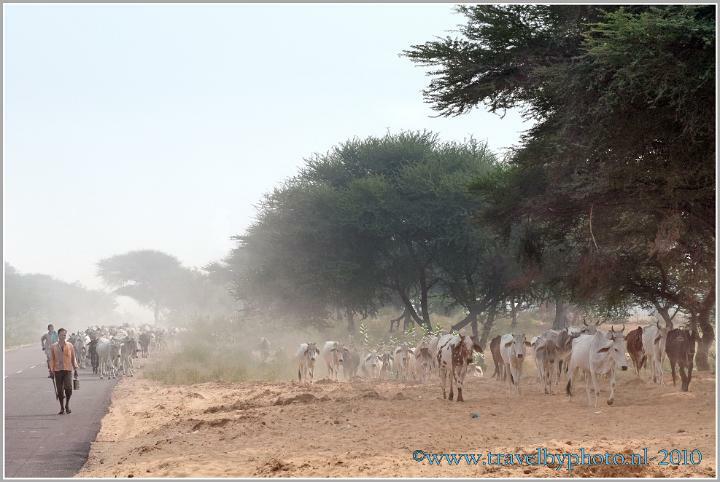 The journey to Phalodi takes us through the desert. At a few miles distance of Phalodi we make a stop at Khichan. 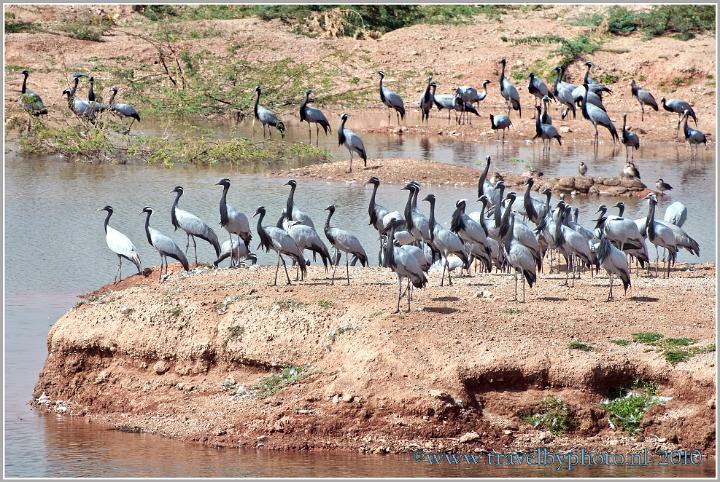 Khichan is a small town with a lake were thousands of Demoiselle Cranes (Anthrapoides virgo) gather. They are here from Siberia to hibernate. People for centuries give the birds food here. 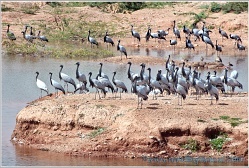 It is truly an amazing sight as the blue-gray birds fly low over the sand dunes. The place seems to be more structured than 5 years ago. There is now a path to the lake and a kind of lookout tower. We can come pretty close to the birds. After our stop at Khichan we drive on to Phalodi. Our hotel in Phalodi is the Lalniwas Heritage hotel. It is a very atmospheric and nice hotel. The hotel is one of the reasons that we wanted to revisit Phalodi. Unfortunately for the hotel owner we are the only guests . It is a pity that not more guests find their way to the hotel, because it is really worth wile. 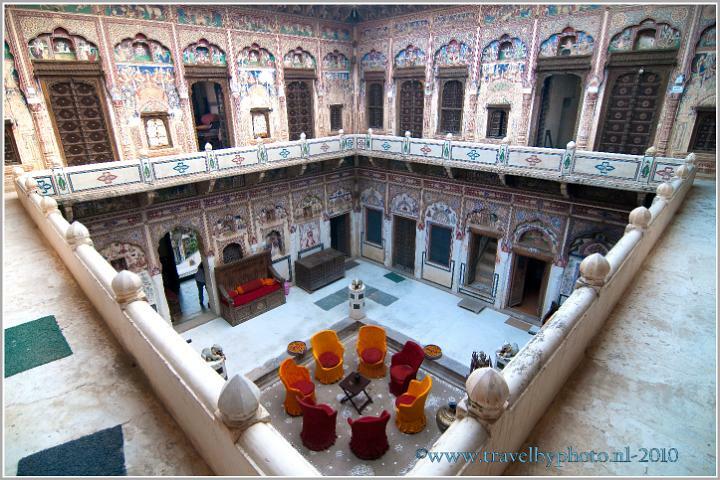 The hotel is an old haveli situated in a very authentic street. Many blue walls and stairs, and of course cows in front of the door. In the afternoon we take a walk through the town. Phalodi is not at all touristic. We take a lot of pictures. Almost everyone likes to be photographed. There is even a man with beautiful turban who took a handful of candy and nuts from his pocket, and gave it to Ingrid as a sign of gratitude for the fact that his picture was taken. 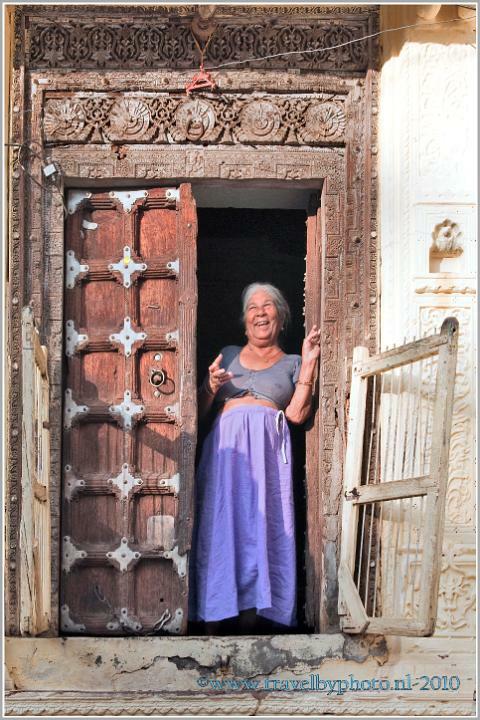 Again many beautiful havelis but also many expired. India will look different in 20 years. Let's hope that the government and / or individuals will realize in time that they must keep their heritage alive because it is really unique. A lot of cows and turbans will probably disappear from the streets, but currently that is not the case here in Phalodi. There is a lot to see. It is quite warm due to the typical desert climate. The city of Phalodi is larger than we remember. Today we have breakfast at 7:30 a.m. After breakfast we make a last walk through the town. Phalodi is really a must to visit, especially since there is ......... nothing special to do. So just enjoy watching the people; it´s a showcase of traditional life in Rajasthan with the beautiful women with nice traditional jewellery. 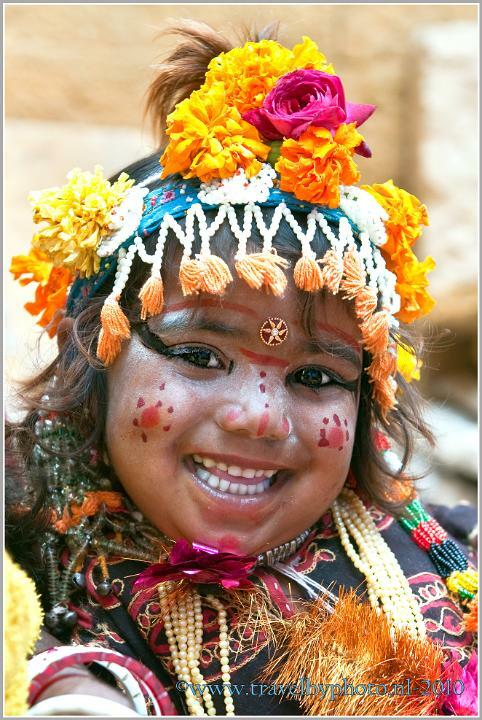 Especially the ornaments on the forehead are striking. 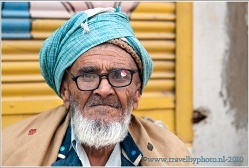 The men with their colourful turbans, small streets. Even without heavy traffic, traffic is chaotic with a lot of tuk -tuks, bicycles, people, carts and the cows. The people of Phalodi are not used to tourists so for them; we are the main attraction. At a vegetable market Jan-Arend is suddenly attacked by a bull. He can jump away in time, but can´t avoid that his pants is completely ripped open. So he continues his walk almost in his underpants! Ingrid got the giggles when she saw it and all the people had to laugh too. They hang out of the windows to see the strange white man in his boxers. The clown of the town! 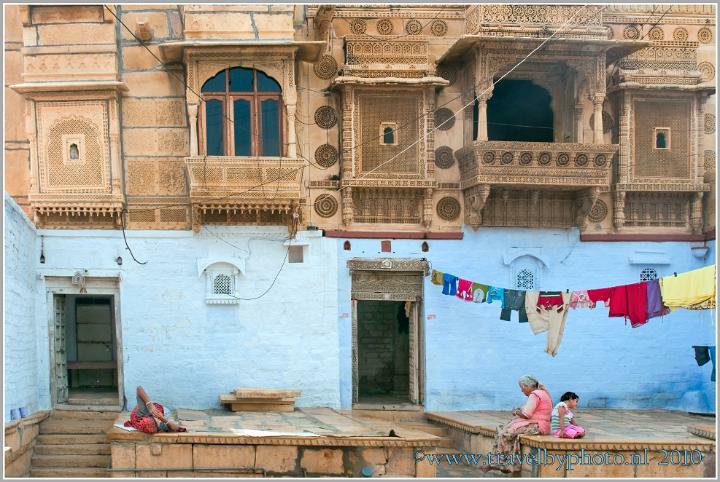 After our walk through the town we leave for Jaisalmer. It is about three hours drive. The road is pretty good. To watch the traffic on the roads is exhilarating. Thank God that the people have no short fuses. If an oncoming car makes a irresponsibly passing manoeuvre, the other road users just reduce speed, give room, shrugs, shake a little with the head and puts a big smile on the face. But you have to have nerves of steel because an accident is always just avoided. 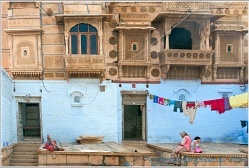 At noon we arrive in our hotel in Jaisalmer. Fifu hotel. The hotel is situated in walking distance of but outside the walled city / fortress. It is a nice hotel with a nice roof terrace where we are offered a welcome drink and enjoy the wonderful view on the fort, in the distance. Our lunch consists of delicious pancakes. An apple pancake here is just a pancake containing a peeled apple into wedges. At 1 o'clock p.m. we are picked up at the hotel for a ride in a 4WD in the Thar dessert. The ride is not very spectacular. After a short visit to a small village we drive further into the desert to an abandoned village called Paliwal Brahmins. After the Mughal invasion 400 years ago, all the inhabitants of the village had to flee the city at night leaving everything behind. This village was a remnant. Ruins of houses and a beautiful temple still quite intact. Special! 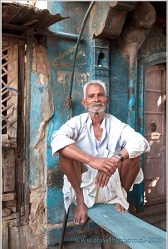 At entrance of the village sits a man who sells tickets for 10 rupees. A beautiful and very friendly man who plays for us on 2 flutes simultaneously. Very impressive. Can you imagine; we are in a desert. It is summer. It is India and then ..... suddenly, unexpectedly and surprisingly it starts to rain and thunder. That is what happens! So we have to hurry back to the jeep. The ride back to Jaisalmer tearing through the puddles is fun. We will not keep it dry in the jeep. The wipers are broken; only a grumbler pays attention to those kind of things here because it never rains! Well ...... almost never. Finally arrive back at the hotel. We presume that we can sit on the roof terrace because it is covered, but everything is wet. There is water everywhere. All the cushions are wet and the electricity is broken off. So we leave for our room. As the rain finally stops, the electricity is fixed and the chaos on the roof is quickly restored. Ultimately it is even possible to drink a delicious Lassi outside on the terrace, make use of the internet and have nice meal served! For the first time this holiday we experience the luxury of really warm water from the shower! So we both take a nice shower and we end the day with a good glass of wine. At 9 o'clock a.m. Kuldeep collects us at the hotel. He will accompany us to a lake nearby. Primarily a destination for domestic tourists. There are many local tourists here because November is a month with many celebrations. 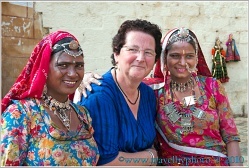 The Pushkar Fair also attracts many people. 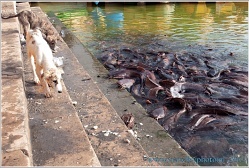 There are a lot of catfish swimming in the lake The catfish are fighting for the bread you give them and if the bread is on the lowest stair they even jump out of the water to grab it. Sometimes they lie almost entirely on dry land! It is fun to visit the lake but we do not stay long. 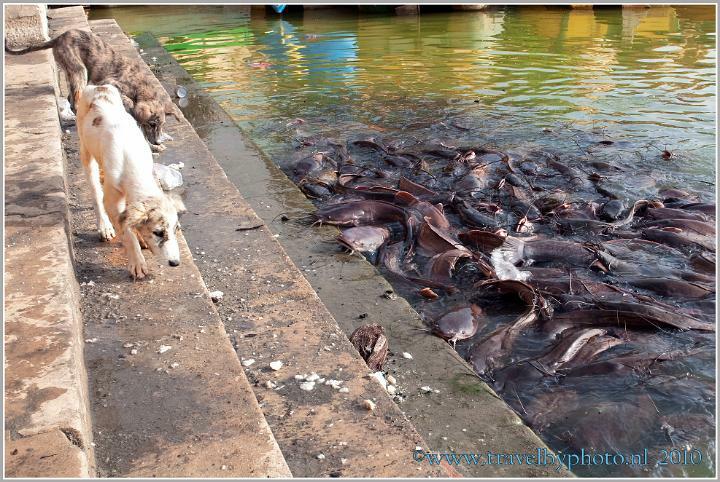 There are a lot of catfish swimming in the lake The catfish are fighting for the bread you give them and if the bread is on the lowest stair they even jump out of the water to grab it. Sometimes they lie almost entirely on dry land! It is fun to visit the lake but we do not stay long. 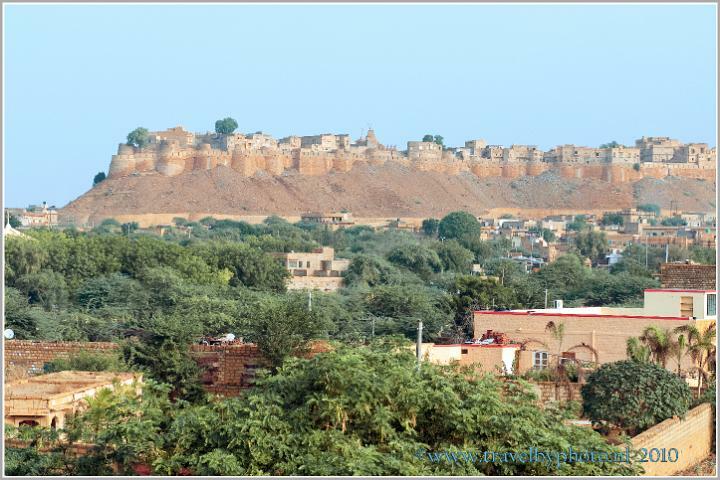 We leave for Jaisalmer fort. We don't want a guided citytour. 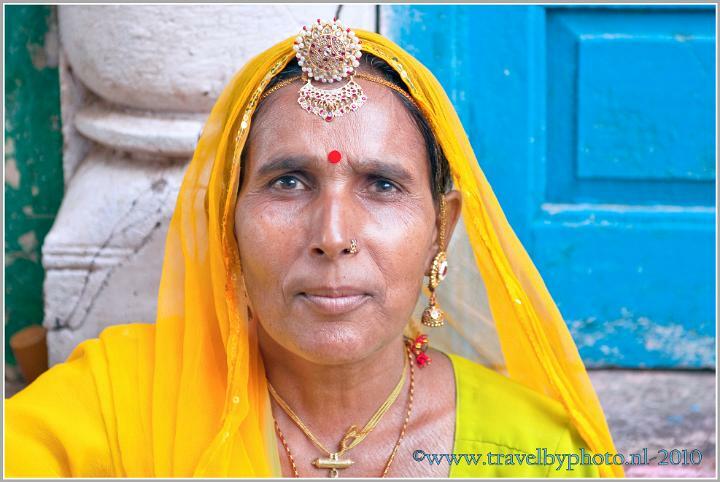 We enjoy ourselves by walking around, We meet a woman who sells jewellery. She is the same woman we met five years ago. She is still as beautiful as then, only four children richer! A hard life. Beautiful walk in the fortress. Everywhere there is something to see. After our Phalodi experience we keep a bit more distance the cows and bulls. There are a lot of them within the walls of the fort. It is crowded with people too. Most Indian tourists. We are often lured into a store to see the unique merchandise on display. We take a pause and eat some tasty pancakes for lunch. A street musician sings a love song in a touching way. He accompanies himself on a Kamancha: a traditional Indian string instrument. Above one of the gates of the fort is an Italian restaurant where we drink a cappuccino. We have a seat at the window where we have a wonderful view on the first gate of the fort. On the square we see a acrobat tightrope walking on a tightrope. After our visit to the city we walk back to our hotel. It take only 10 minutes to walk to the hotel. Looks further. The road to the hotel is very muddy after the rain yesterday. Between the mud, we see some piglets, even with little ones. Completely in their element. After dinner Jan-Arend goes for a massage somewhere on the outskirts of the city while Ingrid stays at the hotel enjoying an extra banana lassi on the rooftop terrace. 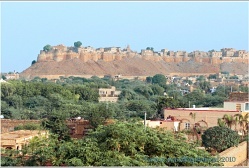 In the background the impressively Jaisalmer fort where we were today.